Sittings to Miss Curran took place in Rome in May 1819 and are recorded in Claire's Journal. Amelia Curran, daughter of the Irish firebrand J. P. Curran, was in Rome studying art, joined the Shelley circle and painted several portraits, none of which found much favour with either the sitters or the artist herself. Shelley's portrait was begun when he was 'but lately recovered from a feverish illness', according to Dowden 'the hasty work of an imperfectly trained amateur, is that by which the face of Shelley is most widely known' (Edward Dowden, Life of Shelley, 1886, II, p 266). After Shelley's death, Mary realised that this was one of the few portraits of Shelley in existence and on several occasions wrote to Amelia Curran asking if she could have it. Amelia eventually answered from Paris saying that she had all but destroyed it while packing up her Rome studio: 'it was so ill done; I luckily saved it just as the fire was scorching it, and it is packed up with my other pictures at Rome'; this story may be true but there is no trace of melted paint or scorch marks today. A posthumous edition of Shelley's poems was projected by Mary herself with the help of T. L. Beddoes and others, and the portrait was needed for an engraving for the frontispiece, but as it happened Amelia was in London and was persuaded to make a drawing which was engraved by Wedgwood for the title-page, published in 1824. The picture itself finally arrived in September 1826, to Mary's ecstatic delight - 'unlike aught earthly wert thou ever and art now!' Others were less enthusiastic. Trelawny thought it 'never finished and left in an altogether flat and inanimate state'; Peacock preferred a portrait of Leisman; 'Otherwise, it has aroused almost as little enthusiasm as Droeshout's image of Shakespeare' (David Piper, The Image of the Poet, 1982, p 162). 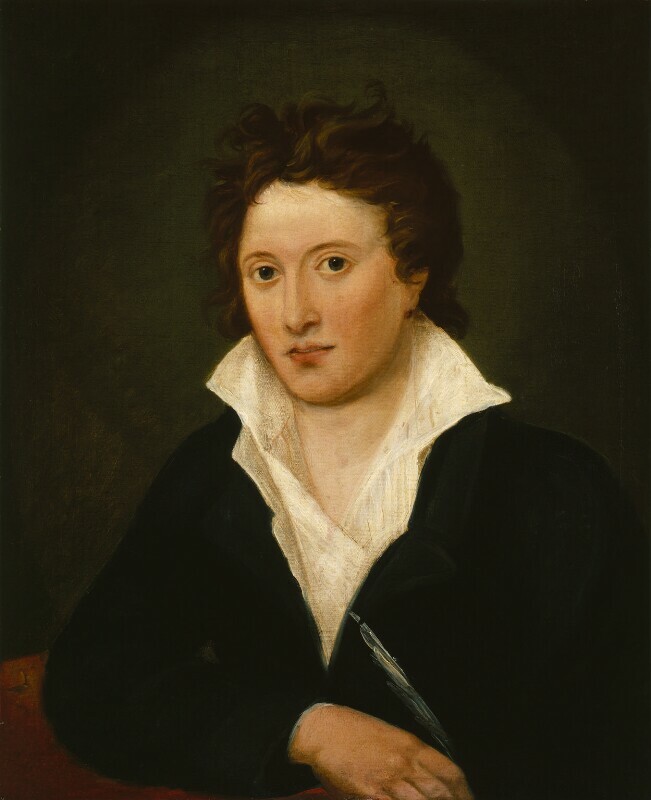 Mary however treasured it to the end of her life when it passed to her son Sir Percy Shelley who hung it in the Shelley 'sanctum' at Boscombe Manor (R. R. Grylls, Mary Shelley, 1938, pp 253-4). Harry Buxton Forman used an engraving of it as frontispiece to The Poetical Works, 'in deference to the wishes of Sir Percy Shelley who, on the high authority of his mother, maintains that it is the best portrait extant' (Harry Buxton Forman's notes, I, xxxix). It passed by bequest of Lady Shelley to the NPG in 1899. Half-length seated holding quill, dark blue coat, white open-necked shirt; dark brown hair, large dark blue eyes, pale complexion, vapid expression. Family possession and bequeathed by his daughter-in-law, Lady Shelley, 1899. Third Exhibition of National Portraits, South Kensington, 1868 (153) lent by Sir Percy Shelley; Exhibition of the Royal House of Guelph, New Gallery, 1891 (212) lent by Lady Shelley. Small lunette by J. T. Wedgwood in Galignani's edition of Posthumous Poems, 1824; stipple vignette by Finden 'From an original picture in the possession of Mrs Shelley', with facsimile of signature, Percy B Shelley, published John Murray 1833; others appeared throughout the 19th century.